Palm Springs Photo Diary | La Petite Noob | A Toronto-Based Fashion and Lifestyle Blog. I'm going to be honest with you; I like to travel with an itinerary. As much as I love the romance behind the idea of visiting a new place and letting the flow of the day dictate your schedule, that's just not me. Give me lists, give me restaurant reservations, give me structure. I come to a new location prepared, researching every last facet to make sure that's we're not missing anything. That all flew out the window, or should I say burst into flames, when we drove into Palm Springs from LA and were confronted with our first experience with 45+ degree (Celsius) heat. My lawd. 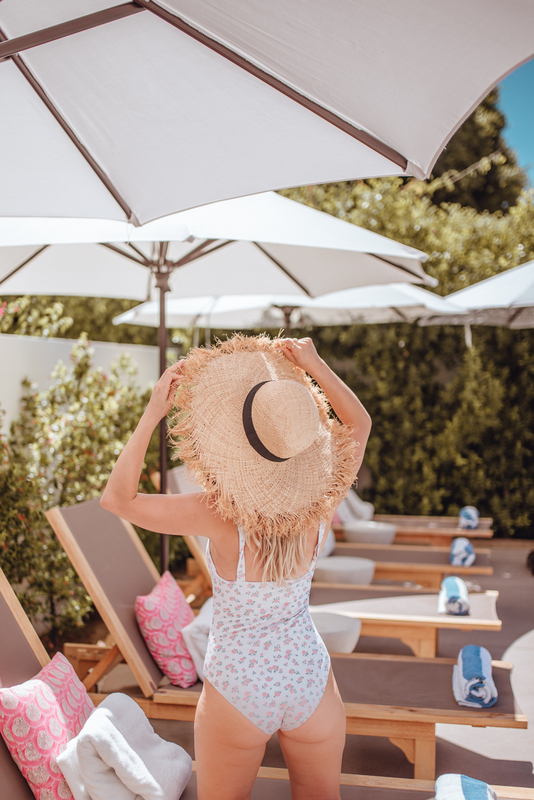 The desert heat is no joke, and visiting Palm Springs at the tail-end of summer meant that my ambitious itinerary was revised to only include one task: stay in the pool. Thankfully we absolutely struck gold with our hotel for the stay. La Serena Villas was relatively new when we had booked in back in January, and with only a few reviews it seemed like we were taking chance on it. In the end, I could not have been any happier with the location, grounds or service of La Serena Villas. I could go into great detail, but honestly the photos of this property speak for themselves so please enjoy. Ultimately our stay was incredible and both Brian and I agreed that this would be our go-to hotel for any future visits to Palm Springs. So other than late morning breakfast in bed, days spent lounging by the pool and early dinners at the hotel there isn't much to report. The few times we did leave our property it was mostly for snack-runs or cheap tacos, with only a few hotel visits and sights along the way. As much as I would have loved to have written an in-depth city guide to Palm Springs, sometimes you have to just roll with the punches and honestly looking back now, I'm glad that the extreme heat forced us to take a slower pace. The universe gives you exactly what you need without having to ask, and a few days by the pool was exactly what the doctor ordered. Besides - there's always next time. Palm Springs, I'll hopefully be seeing you sooner rather than later. What do you guys think? Do you love itineraries when you travel as much as I do? Let me know! These pictures are so lovely, Palm Springs is one of my top bucket list destinations, it just looks so pretty and relaxing!